We welcome your participation in the 7th and final instalment of our current series on Environmental Governance in the Extractive Sector, hosted by Swedish Environmental Protection Agency, the NBSAP Forum at UNDP, and GOXI. 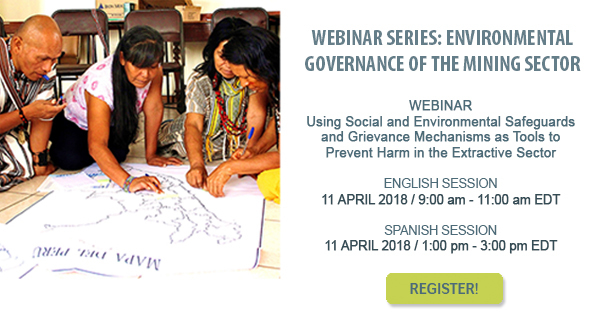 This week's webinar is entitled “Using Social and Environmental Safeguards and Grievance Mechanisms as Tools to Prevent Harm in the Extractive Sector” and takes place Wednesday the 11 of April. 9 am EDT English and 1pm EDT for Spanish. Click here for further details on the webinar in English, Click here for Spanish information. Please share widely in your networks, we have a group of excellent presenters from Mongolia, South Africa, Chile and the United States, who will be featuring case studies from mines in Mongolia and Perú to explore these important tools on keeping people and the environment safe where mining, oil and gas projects operate. After the links above, just need to follow the green button to register. We look forward to seeing you online for this interactive session!